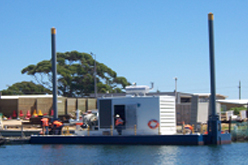 Over the years Crib Point Engineering have made many boats, barges and floating plant. These have ranged from High speed supply boats, Yachts, Tug boats to 55 meter heavy oil bunker barges. Crib Point Engineering's Ability to fabricate and fit out vessels in there factory, and then roll directly out onto the slipway for launching can greatly reduce time and costs in the manufacture of small to mid sized craft. Our Slipway has the capacity to launch and retrieve vessels up to 60 meters with a weight up to 500 tonnes. 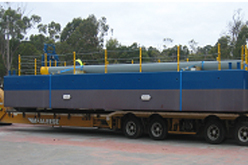 The draft of the vessels can be up to 2.8 meters. Crib Points Engineering's facility has no real width restrictions we have slipped barges with more than 18 meters beam in the past.